Sear, sauté, simmer, slow cook low, boil/steam, rice, soup, risotto, pilaf, porridge, bake and yoghurt functions. Tackles the most demanding recipes such as spaghetti sauce, paella, risotto and more. Sear meats at high temperature to seal in moisture and juices. Special yoghurt mode at 35°C. Step by step guidance for stews and slow cook preparations for the best, tastiest results. Provides a precise time and temperature read and displays assisted step-by-step instructions modes. Prevents food from sticking, ensures even cooking. Lid allows for easy pouring and straining. Mixes, flips, stirs and incorporates ingredients to ensure heat distribution and thorough cooking. 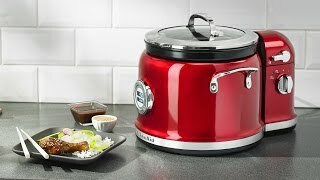 Multi-Cooker with Stir Tower Medallion Silver is rated 2.5 out of 5 by 2. Rated 4 out of 5 by Jmcc8322 from Great colour I bought this yesterday & I love it. Cooked a great Lasagne sauce, delicious !